Aldi, the fast-growing discount grocer, held the grand opening of its new store in Fairfield on Thursday. In typical grand opening fashion for Aldi, a Golden Ticket giveaway followed the 8:30 am ribbon cutting. In addition, 100 customers received gift cards and a cloth shopping bag. 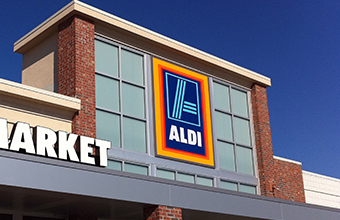 Andrew Feinblatt of OnSite Retail Group represented Aldi in the purchase of the 2.2 acre site for the new 22,150 square foot store at 5065 Pleasant Avenue. Feinblatt represents the grocer across southwestern Ohio and northern Kentucky.